Have you ever intentionally caught a common carp? That may seem like a ridiculous question to an angler in the United States where these barbeled bottom dwellers usually are considered trash fish. In much of Europe and Asia, however, carp are highly prized sport and table fish. Why do anglers look down on a fish valued by millions of anglers across the ocean? Why do they grimace at the thought of eating a fish still meticulously prepared by chefs in the finest European restaurants? Why do they thumb their noses at a fish esteemed throughout the Orient and the rest of the world? There are good reasons. Carp muddy the water and often crowd out gamefish. They destroy fish and waterfowl habitat by uprooting aquatic vegetation. They adapt to the most polluted conditions and are often seen finning near the surface in stagnant water. Carp are not the type of fish most anglers would have mounted for the wall. Nevertheless, carp are here to stay, and they still possess the attributes that make them popular in other countries. They’re challenging to catch, superb fighters, widely distributed and abundant in many waters. Ten- to 20-pounders hardly raise an eyebrow. Contrary to popular opinion, carp are also superb food. In fact, the common carp is said to be the most popular freshwater food fish in the world. We’re stuck with this bewhiskered alien, so why not make the best of it? If you want to broaden your fishing horizons and catch a different species, one that’s overly abundant and possesses all the qualities of a blue-ribbon sportfish, consider the carp. A heavyweight carp moves with the power and speed of a striped bass, can outfight a largemouth and makes a hefty trout look like a sissy. Knowing this, the avid carp angler generally selects a medium to medium-heavy rod with progressive taper, at least 6 feet long. 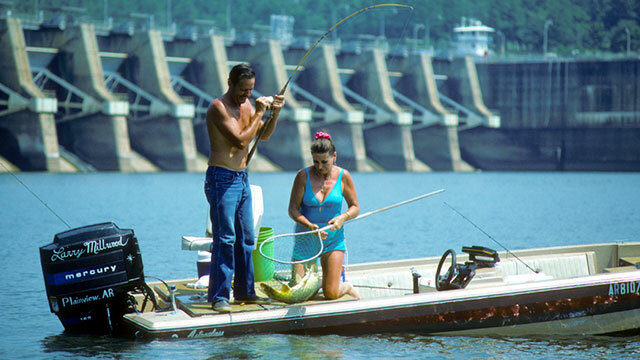 The longer the rod (up to 11 or 12 feet), the better the angler’s chances of handling large fish. Pair the rod with a medium-weight spinning reel with a good drag that can hold at least 120 yards of 12-pound-test mono. Single and treble hooks are both used for carp fishing, usually in sizes 6 through 2. They should have sharpened points and heavy-gauge wire construction. Use sensitive Euro-style bobbers, and have on hand an assortment of split shot, egg sinkers and bank sinkers, and some small barrel swivels to use as sinker stops. A large landing net is a definite asset, too. Carp are bottom-feeders, and two bottom-fishing rigs will serve the carp angler in most situations. The first holds the offering in slow, steady river currents. To make this rig, tie a double surgeon’s end loop on your line’s end. Make the loop the diameter of a golf ball. Then use a Palomar knot to tie a size 6 to 2 bait-holding hook to the doubled line. Eighteen inches above the hook, make a dropper loop knot, and onto it tie a 1/4- to 1/2-ounce bank sinker by way of another Palomar knot. Carp are smart and shy, so a rig like this with no swivels or other hardware usually works best. The other rig, designed for still water, is simple to make. Thread a 1/2-ounce egg sinker on your line, then tie a barrel swivel to the line’s end. To the other end of the swivel, tie an 18-inch leader of 10- to 14-pound-test monofilament. To this leader, tie a size 6 to 2 bait-holding hook. Use a Palomar knot to tie the hook to the leader and to tie the leader to the swivel. Many carp anglers use whole-kernel corn, doughballs or chunks of bread or half-boiled potato for bait. Carp strike other baits, natural and artificial, but these are among the best. Doughballs are also extremely productive and fun to prepare. Corn meal, flour and a sweet or pungent scent are the core of most recipes, but it’s fun to experiment with your own variations. To get you started, here’s a doughbait recipe from “Carp in North America,” published by the American Fisheries Society. Mix 1 cup sugar, 2 cups white flour and 3 cups cornmeal in a bowl. Slowly add water to produce the consistency of modeling clay. If the dough needs stiffening, add more flour and cornmeal. To thin it, add more water. Flatten the ball, wrap it in a cloth bag, and place in boiling water for 20 minutes. Cool the dough, then put it in a plastic bag and refrigerate. To add other fillers, blend them in before cooking. For scents, knead them in after cooking, once the mixture cools enough to handle. The carp angler casts his baited rig to a likely looking spot, allows the bait to sink to the bottom, then tightens the line to remove all slack. The rod is held in hand or braced in a rod holder. The reel is free-spooled so biting fish feel no resistance. Line movement indicates a fish has found the bait. Carp usually pick up the bait and start swimming away. When this happens, set the hook hard and prepare for action. A hooked carp fights like a lassoed steer. Carp occur in rivers and lakes throughout much of North America. They bite year-round, even in winter, and can be caught throughout the day and night. Look for them in deep-water areas in winter, but during the rest of the year, the best areas to fish are generally shallow, weedy habitats. In lakes and ponds, look for carp near vegetation in shallow bays, tributary mouths and shallow flats adjacent channel drops. Stream hotspots include shallow backwaters, the upper and lower ends of riffles, shallow pools and shallow structure in dam tailwaters. Like mosquitoes, carp are part of our ecology whether we like them or not. It’s not likely they’ll ever exceed the popularity of fish like largemouth bass and crappie, but they’re certainly due a measure of respect that is presently lacking. The attitudes most anglers have toward carp can be summarized by an exchange of words I had one summer day with a bass angler who trolled past my carp fishing hole. Just then line started peeling off my reel, and I set the hook on a dandy carp. The fish threw spray into the air, then popped my line and was gone. The fisherman stared at the swirling water. “That looked like a nice one,” he said.